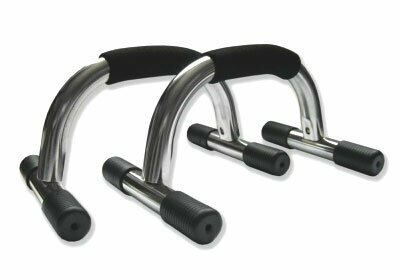 Push Up Bars(GTTG511) Martial Arts training accessories. With a set of Push Up Bars you can minimize hand, wrist and elbow stress when performing push ups. Bars feature heavy gauge steel construction, foam covered hand grips and non-slip plastic end-cap protectors. Easy assembly; sold only in pairs. Use them to build upper body strength, especially shoulder, chest and upper back muscles. Great item, rapid delivery. Thanks!